Chicken Marbella is a wonderfully easy dish to prepare with very little clean-up. (And isn’t that what all us single parents need? )I love how elegant it is and it’s great to serve when you have friends coming over as adults love it and kids do too! If you have picky eaters, this dish will introduce them to Mediterranean flavors and we all know that a Mediterranean diet is one of the healthiest for longevity. Read this article by the Mayo Clinic if you want further proof! While this dish does require some pricey ingredients, if you stock your pantry with them once a month, you’ll be able to cook a variety of dishes at the drop of a hat. I started cooking Marbella more than 10 years ago from a recipe that I found in the Silver Palate Cookbook by Julee Rosso & Sheila Lukins. I’ve tweaked it so much over the years that it’s my own version now. Cook a lot more than you need, as it’s actually better the next day with extra marinade time, is good cold at picnics and also freezes well. I hope you and your family enjoy it as much as we do! 8 chicken breasts cut into small 1/2 inch to 1 inch pieces. Optional item: small pearl onions. Combine the olive oil, vinegars, prunes, apricots, olives, capers and juice, bay leaves, garlic, oregano and salt and pepper in a large bowl. Add the chicken and stir to coat. Cover the bowl and refrigerate overnight.Preheat the oven to 350°. Arrange the chicken in a single layer in one or two large, shallow baking pans and spoon the marinade over it evenly. Sprinkle the chicken pieces with the brown sugar and pour the wine around them. Bake, basting occasionally with the pan juices. 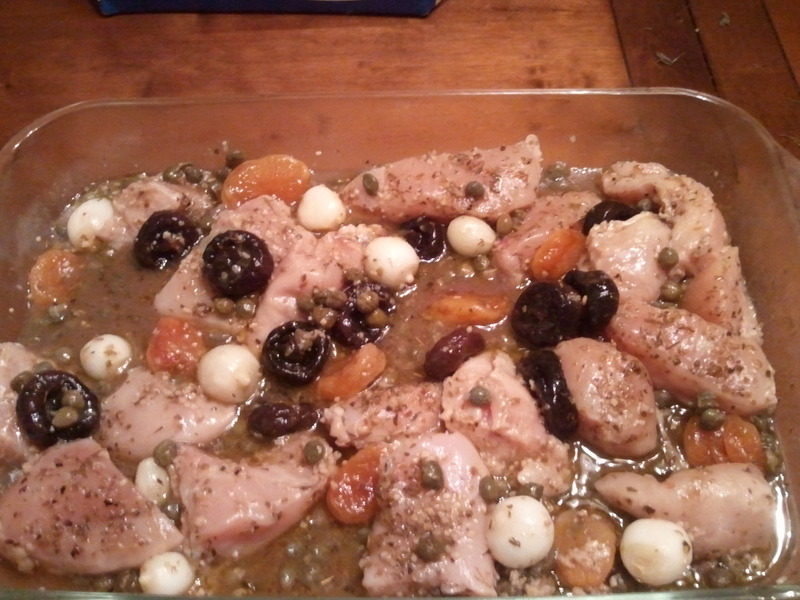 Cook for 45 minutes, but check after 30.With a slotted spoon, transfer the chicken, prunes, olives, and capers to a serving platter. Moisten with a few spoonfuls of the pan juices and sprinkle generously with the parsley or cilantro. Pass the remaining pan juices in a sauceboat. Serve over couscous and with a mixed green salad. This entry was posted in Cooking and tagged chicken marbella, Cook, dinners, elegant meals kids will eat, fast meals, fussy eaters, Julee Rosso, Marbella, marinated, Mayo Clinic, Mediterranean diet, Olive, Olive oil, one pan dinners, quick, quick and easy meals for the whole family, Sheila Lukin, Sheila Lukins, Spanish cooking, The Silver Palate Cookbook, Vinegar. Bookmark the permalink.